Raffi is Coming to Town! 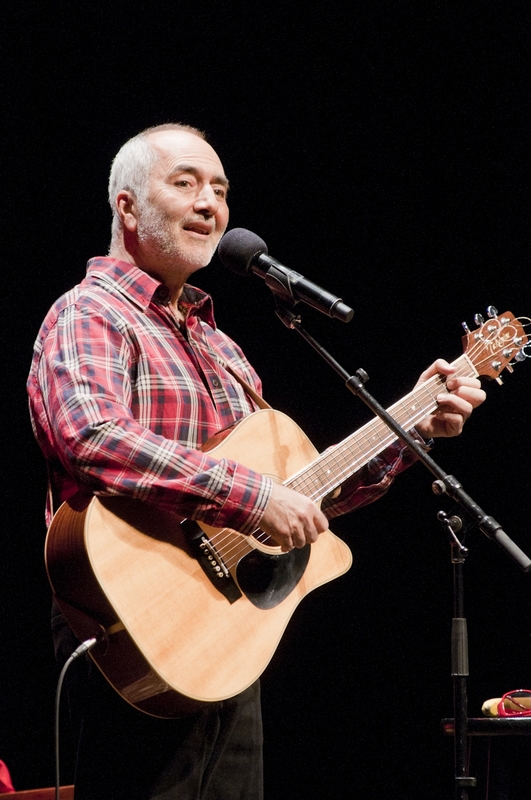 The all time children’s superstar, Raffi, is on tour! Haven’t heard of Raffi? Well, he has been creating classic children’s music since the 70s. His songs like Baby Beluga, Down By the Bay and Apples and Bananas have captivated generations of children. I’ve been a fan since probably the 80s when his tunes entertained me and my little brothers and sisters. Now, Raffi’s songs entertain my little boys. On a daily basis, Bobby marches around the house singing Apples and Bananas. And, CJ chimes in with grunts here and there. I just can’t wait to let them sing Apples and Bananas with Raffi live in concert! Luckily neither they nor I will have to wait that long since Raffi is on tour! He will be in Berkeley on April 6, then hopscotching around the country. Interested in more details? Then, click here. April 6: Berkley, CA — Zellerbach Auditorium — 1pm. April 7: Santa Barbara, CA — Arlington Theatre — 1pm. April 28: New York, NY — The Town Hall — 1pm. April 29: New Haven, CT — Shubert Theater — 7pm. May 4: Boston, MA — Berklee Performance Center — 1pm. May 5: Washington, DC — Warner Theatre — 1pm. May 18: Minneapolis, MN — The State Theatre — 1pm. May 19: Aurora, IL — The Paramount Theatre — 1pm. The concerts will benefit the Center for Child Honouring, an organization founded by Raffi based upon a Covenant for Honouring Children, an absolutely inspirational movement promoting the rights of children and aimed at bettering the world for all children. Check back for more information about the Covenant for Honouring Children as it more than warrants a separate discussion. This entry was posted in eagle mom, kid friendly Sonoma, parenting, tips, Uncategorized and tagged April 6, Athens, Baby Beluga, Berkeley, Bobby, Boston, Child Honouring, Children's music, Dynamic music, Early Childhood, Early music, Education, Greece, Honouring Children, Literacy, Music, Music education, Plato, Raffi, Raffi Cavoukian on March 26, 2013 by Modern Mama. Some say the first language of babies is music as they experience it in the womb. From this early exposure, babies learn to love rhythm. I noticed Bobby’s special connection with rhythm from the first moments of meeting him. He was a bit of a fussy baby. So, a constant dance-like bounce was all that would soothe him. Once that stopped working, he would calm by listening to Yo Yo Ma. The drastic impact music had on Bobby got me thinking about the relevance of music in his development. I’ve learned that a connection with music plays an important role as the foundation for literacy and other social and cultural development. “The necessity of music in human intellectual development has been discussed as far back as ancient Greece, in the 6th century B.C. In Plato’s Book of Laws II, a discussion is presented between an Athenian student and his teacher, Clinias, that describes the ancient Greek views on the importance of music education. Athenian: So, by the uneducated man we shall mean one who has no choric training; and by an educated man whose choric training has been thorough. Athenian: And, mark you., the choric art as a whole embraces both dance and song. Athenian: Thus it follows that a well-educated man can both sing well and dance well. Continuing Bobby’s exposure has been a bit tricky. At 3.5 years old, he seems a bit young to sit through lessons. But music is still on his mind. The other day, he was in the backyard with two sticks. One was double his height. He held it upright in one hand and took another stick and began to strum the larger stick. When asked what he was doing, he replied that he was playing the cello. Later that night he pretended to play the flute. And, his little brother, who we call Bam Bam due to his love of banging on everything and everyone, used two sticks to beat the ground. Future drummer? Maybe. So, we had a delightful time singing songs amidst the trees. After all, in the words of Raffi, you’ve gotta sing when the spirit says sing. The favorite song these days is Baby Beluga. Thank you Raffi Cavoukian, the superstar of kids’ music, for creating this charming song that introduces lil ones to the wonders of the ocean. Singing Raffi with my kids is nostalgic for me as I remember singing his songs with my six younger siblings. Haven’t heard of Raffi? Well he has been creating classic children’s music since the 70s. I’ve been a fan since probably the 80s when his tunes entertained me and my little brothers and sisters. For me, it is wild that now, I am enjoying his music with my own children. What’s wilder than that? Well, letting them experience Raffi in concert. Raffi will be on tour this year. He will be in Berkeley on April 6, then hopscotching around the country. Interested in more details, then check here. The concerts will benefit Child Honouring, an organization founded by Raffi based upon a Covenant for Honouring Children, an absolutely inspirational movement to help make the world a better place for all children. Check back for more information about the Covenant for Honouring Children as it more than warrants a separate discussion. There are so many ways to introduce young kids to music. From streaming music in the background, asking them what they think of it, singing, dancing and playing instruments or sticks as the case may be. In addition, concerts are a great way to let them gain another perspective. Raffi’s concert is one such event and should be amazing! But if you can’t make that, then check out your local community. Consider attending a high school performance, church choir concert, music class or youth symphony. Library storytimes also can incorporate music as well. Thanks for reading! Wishing you and your little ones magical times making music memories! This entry was posted in eagle mom, kid friendly Sonoma, parenting, tips, Uncategorized and tagged Athens, Baby Beluga, Children's music, Dynamic music, Early Childhood, Early music, Education, Greece, Literacy, Music, Music education, Plato, Raffi, Raffi Cavoukian on March 21, 2013 by Modern Mama.